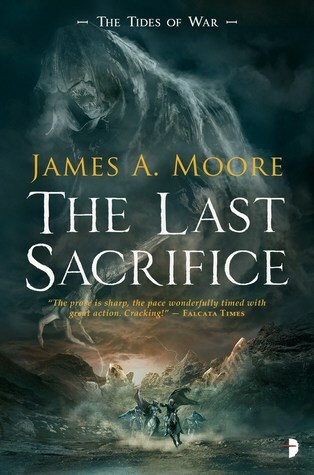 A dark tome of grimdark fantasy, The Last Sacrifice is a story that begins with the kind of epic journey that would end any other book. Instead of taking an entire novel to breach the forbidden lands, confront the servants of the gods, and reclaim his family, Brogan McTyre does all that in the first few chapters. That his quest doesn't end well shouldn't come as a surprise, but just how much damage his intervention causes is staggering. James A. Moore offers up a story where the threat of divine retribution is a foregone conclusion. Having been denied their sacrifice, the gods immediately set about destroying the world, erasing one land after another in a catastrophic torrent of storms, earthquakes, floods, and landslides. All they want is the men who foiled them for a replacement sacrifice, and the servants that were stolen from them. Unfortunately, Brogan and his men aren't about to give themselves up, and the slavers to whom they sold the servants aren't about to give up their high-priced goods. This is a fast-paced, violent, imaginative read with some deep philosophical roots. It's not blatant or heavy-handed, but there are questions of ethics and morality throughout. Good people do horrible things for good reasons, and more than once we're forced to confront the laws of man versus those of the gods. Just about everybody understands why Brogan broached the forbidden lands, and even kings admire him for defending his family. Similarly, not even the doomed family who helps them can blame the two slaves who escape their divine captivity. As unfortunate circumstances lead to difficult choices, however, the story gets rather muddy. The characters here are all well-drawn, carefully constructed individuals with real personalities and genuine motives. Even the servants of the gods are permitted 'human' roles, forcing us to sympathize with both sides of the battle. As for the wraith-like Undying, they are a supernatural horror to be reckoned with, monstrous forces of divine wrath who are fully-fleshed characters on their own. Although we never see fully within their cowls, what we do see, hear, and feel is enough to add a very Cthulhu-like edge to the horror side of fantasy. At this point I have no idea where The Last Sacrifice is headed, or how Moore can possibly resolve all the conflicts without betraying the sacrifices involved . . . and I love it. This is a story that turns the genre story arc on its head, mixes up the motives of heroes and villains, and muddies the waters of divine intervention. A fantastic, surprising start to a major new series. I wasn't a huge fan of Seven Forges but the premise of this one is more up my alley anyway. I need this book now.